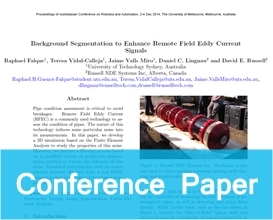 eld Eddy-current, Non-Destructive Testing, Image Segmentation, Finite Element Analysis. ed version of graph-cuts segmentation method to remove the in uence of this noise. Simulated data together with an exper imental data-set obtained from a real RFEC inspection show the validity of the proposed approach.